As the Navy pursues a new anti-ship weapon for its Littoral Combat Ships, Northrop Grumman is pitching its MQ-8C Fire Scout to help the crew find their targets hundreds of miles away. By the early 2020s, the Fire Scout could provide targeting information for the LCS over-the-horizon surface missile and extend its lethal radius up to 300 miles, Scott Kennedy, director of business development for tactical autonomous systems, told USNI News earlier this month. “The Fire Scout is on the ship. The captain has control of the ship and the Fire Scout. Now he has his own asset to generate that over-the-horizon targeting information. That’s a circle of influence and sea control out to about 300 miles,” Kennedy said. However, Northrop is developing internally the ability for the C-variant to have additional data links to share information directly with the targeting system in the LCS combat system. The C-variant is set to field a Leonardo Osprey 30 active electronically scanned array (AESA) by 2020s. Kennedy said the C-variant could field a data link – like Link-16 – to transmit more detailed information from the radar to the ship for targeting information. “What we really want to get to is fully integrated over-the-horizon targeting system. Fully integrated with the ship’s combat system and then ultimately the ability to provide an in-flight target update to a net-enabled weapon,” he said. The C-variant of the unmanned rotary-wing air vehicle is set to operate from the Navy’s emerging fleet of Littoral Combat Ships. The upgraded version of the Fire Scout – based on a Bell 407 helicopter airframe – is pending low-rate initial production approval (Milestone C) from the Pentagon. NAVAIR also conducted a series of Littoral Combat Ship suitability tests earlier this month. 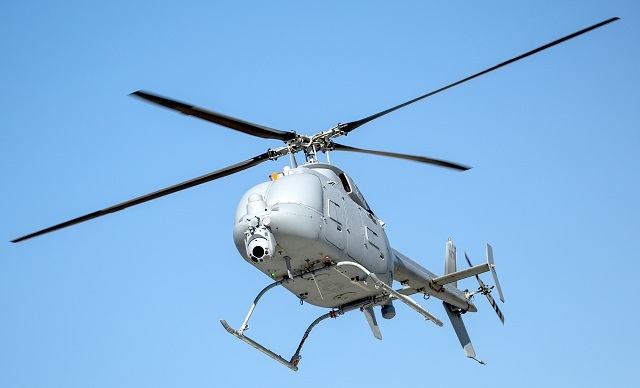 “This test established the MQ-8C Fire Scout as a maritime platform, bringing superior endurance and payload flexibility to the fleet, bringing capability that the U.S. Navy will continue to use for many years to come,” Capt. Jeff Dodge, Fire Scout program manager, said in a statement. The Navy is currently set to buy 70 Fire Scouts: 30 Bs and 40 Cs. While the Fire Scouts are only planned for the LCS and follow-on frigates, Northrop Grumman said they could operate on more ships in the U.S. inventory. “If we do well, you might see us migrating to other ships: amphibs to support expeditionary operations or [destroyers] if that makes sense, but right now they’re tied to LCS,” Kennedy said.